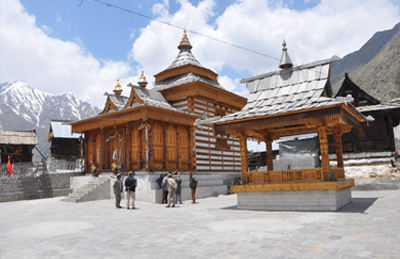 Mathi is the Goddess of local people of Kinnaur. 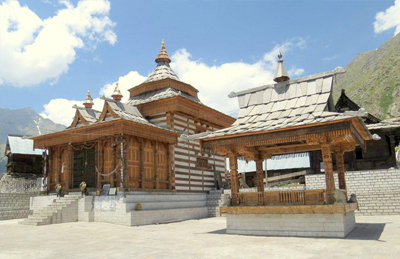 There are three temples in the same complex among which the oldest one is believed to be constructed by a resident of Garhwal around five hundred years ago. The temple houses an ark which is made of walnut wood and is covered with clothes and a tuft of yak tail. Two poles are inserted into this ark to carry it with. Legend According to the legend, Mathi, the wife of Lord Badrinath once started her journey from Brindavan and via Mathura and Badrinath she reached Tibet. Later she came to Garhwal and via Sirmour she reached Sarhan in Bushahr. Her ultimate destination was Barua Khad. While going beyond Barua Khad, she found the land was divided into seven parts. Narenas, her nephew was the deity of Shuang Village. So she appointed him as the guard of the village. Afterwards she moved towards Chasu Village. Narenas were the deity of Chasu Village as well. So she appointed them in Chasu as well. Later she visited Kamru Fort where Badri Nath was protecting the throne of Bushahr. In this process the goddess protected all seven regions of this valley and at last she reached Chhitkul and settled down in Mathi Temple. After her arrival on Chhitkul, the village started prospering. People were growing more and more food and cattle were getting sufficient grass to graze.